A guest player for Exeter City in the 1945-46 season, Franklin was on the books at Middlesbrough. 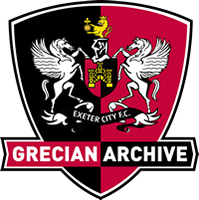 He played one game for the Grecians against Bristol Rovers at Eastville in the Division Three South (South of the Thames) in September 1945. Franklin had signed for Middlesborough in December 1943. He then played for Bath City prior to moving to Darlington in August 1947 where he scored 3 goals in 8 Third Division North matches for them. He went on to play non-league football for Stockton. Franklin died in Stockton in 2005 at the age of 80.